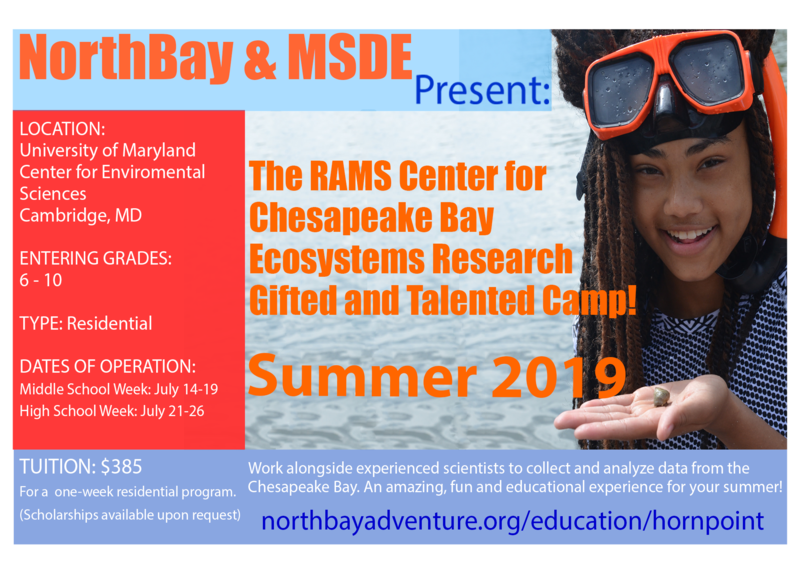 NorthBay, in partnership with the Maryland State Department of Education offers RAMS Center for Chesapeake Bay Ecosystems Research. Located at the University of Maryland Horn Point Laboratory in Cambridge, MD this summer program brings authentic science education to Maryland’s gifted and talented student population. It is not required that students are identified or currently participating in a Gifted program but a strong desire to explore and investigate local ecosystems and challenge oneself will ensure success. Oysters – Explore the historical significance as well as current status of oyster populations in the Chesapeake Bay. Learn about their anatomy, how they filter the Bay, and tour Horn Point’s Laboratory. Wetlands – Investigate the coastal marshes of the Choptank River and all their inhabitants! Learn why these incredibly bio-diverse ecosystems are vital to the Chesapeake Bay and how they help to maintain a healthy habitat. Invasive Species – Through investigating the marshes, meadows and maritime forests of Horn Point as well as an all day canoe trip through Blackwater National Wildlife Refuge and a tour of the Horn Point Laboratory, Learn about specific invasive species that are affecting the Chesapeake bay through investigating the marshes, meadows, and maritime forests of Horn Point. Fish- Sample fish diversity and abundance with multiple methods in the Choptank at various locations at Horn Point. Learn about migratory fish and issues facing them in the Chesapeake Bay. Aquatic Invertebrates- Explore the many invertebrates that populate our Chesapeake Bay including, jellyfish, plankton, and oysters. Investigate their significance to the health of our local waterways and economy. Enjoy an all day canoe trip through Blackwater National Wildlife Refuge as well as a tour of Horn Point’s oyster hatchery. Submerged Aquatic Vegetation- Snorkel the Choptank River in search of bay grass beds. Learn the niche of underwater plants and how fluctuation in population has affected the bays health and productivity. Explore the diversity of life supported by bay grass! Enjoy an all day canoe trip through Blackwater National Wildlife Refuge and a tour of Horn Point’s SAV labs. Crabs- Learn about the importance of Maryland Blue Crabs, their commercial history, and discover crab species that live at Horn Point as we explore different methods of sampling them. All tracks include doing a 1/2 day canoe trip at Blackwater National Refuge, service projects, sailing on the Skipjack Rebecca T. Ruark with Capt Wade, guest speakers, building remote operated vehicles (ROVs), and the opportunity to film a documentary based on your track of study and team. The CIT program is an opportunity for your student to gain real world experience on how to be a positive and effective mentor. CITs will guide campers through their day-to-day activities during the week and provide insight and knowledge from their own experiences. This opportunity is being offered for the middle and high school week of our NorthBay @ Horn Point program. If accepted, the CIT will get half off the cost of camp. NorthBay has a zero tolerance with the following: drugs, alcohol, cigarettes & weapons. Parents will be notified immediately and children will be sent home if found with any of the items listed above. We request that cell phones and other electronic equipment be left at home as they are dangerous distractions during adventure classes. What to Bring to NorthBay @ Horn Point — and what not to bring! Cell phones – If brought to camp, phones may be restricted/collected and returned at the end of camp.